We use our feet constantly and naturally there are common foot problems that occur. This guide looks at the causes and problems of the main ones. Feet are prone to taking their fair share of punishment through walking and wearing tight-fitting shoes, so naturally, they can suffer from pain and other issues. There are lots of different causes and treatments, so, if you suffer from foot pain or want greater comfort, this easy-to-follow guide we’ve created will help you to find out what the problem is while also informing you about what might help. What are the different foot pain problems and treatments? Poor footwear, diabetes, and ageing are some of the chief contributors to foot problems as Mark S. Davies, a Consultant Orthopaedic Surgeon at the London Foot and Ankle Centre, tells us. Here we’ve listed some common issues people suffer from and what causes them. Causes: Wearing tight or narrow shoes can cause bunions to form as they put pressure on the metatarsophalangeal joint (MTP), which is the joint between the bone of the foot and big toe. Bunions (known medically as hallux valgus) are a bony deformity that sees a bump form on the large toe joint and this can cause it to turn slightly inward. As well as the formation of the bump you may notice pain and swelling over your big toe joint, hard and sore skin and changes to the shape of your foot. Mark S. Davies from the London Foot and Ankle Centre tells us a bit more about the condition. There are a number of treatments available for bunions and non-surgical treatments are usually tried first. Our comfortable wide fitting shoes offer extra wide, deep and roomy footwear so that people suffering from bunions do not have to go through the pain of putting on shoes when going out. Here at Cosyfeet we also have a variety of bunion relief accessories to help you or a loved one enjoy some respite from the pain that it can cause. These include gel bunion covers, gel bunion and metatarsal pads and gel bunion relief sleeves. For severe cases, surgery can be considered, and the type of surgery will depend on the level of deformity, age, and the severity of the symptoms. Causes: The fungus thrives in warm, damp areas like showers, pools and gyms. Can be caught walking in these areas barefooted or wearing shoes that are warm and damp. Athlete’s foot is a fungal infection of the skin and is often found between the toes, although the infection can spread and cause discomfort, itching, blistering, cracking and pain to other parts of the foot. Antifungal treatments such as sprays, powders and lotions can be applied to your feet and are available in pharmacists. Petra Kravos, the founder & editor of Be Healthy Now, says feet issues like athlete's foot are common, but that there are lots of treatments available. “Feet issues are very common today although people don't like to talk about them as they are an embarrassing problem. Bunions, fungal infections, cracked heels and ingrown nails are all issues many people face. “Wash your feet regularly and dry them thoroughly - that's very important as any wetness becomes a breeding ground for bacteria. “If, despite your best efforts, you still get feet issues and even pain, the treatment will depend on the type of issue you are facing. For example, for recurring fungal infections and Athlete’s foot use anti-bacterial essential oils such as tea tree and oregano oil. Use them twice a day but dilute them with olive oil before applying directly onto the skin or toe. “For painful, cracked skin, a moisturising shea butter could do the trick but make sure you exfoliate and file the dry skin first. Raw honey and calendula cream are also great for skin healing. Causes: Wearing poor-fitting shoes, not trimming your toenails properly or having a history of ingrown toenails are all the main causes of this condition. An ingrown toenail is a very common issue and is where the nail grows into your toe, causing quite a bit of pain and discomfort. You can get an ingrown toenail on any toe, but usually, it affects your big toe. Ingrown toenails can become infected and tell-tale signs of this include pus coming out of it and feeling hot and shivery. Check out our selection of nail care products that will help you to manage your nails. Our professional nail clippers and nail file can help ensure your nails are kept in a good condition and our gel toe caps can help people who are suffering from an ingrown toenail. Other treatments you can try at home to help ease the pain include soaking your foot in warm water three or four times a day and wearing wide fitting shoes or sandals. 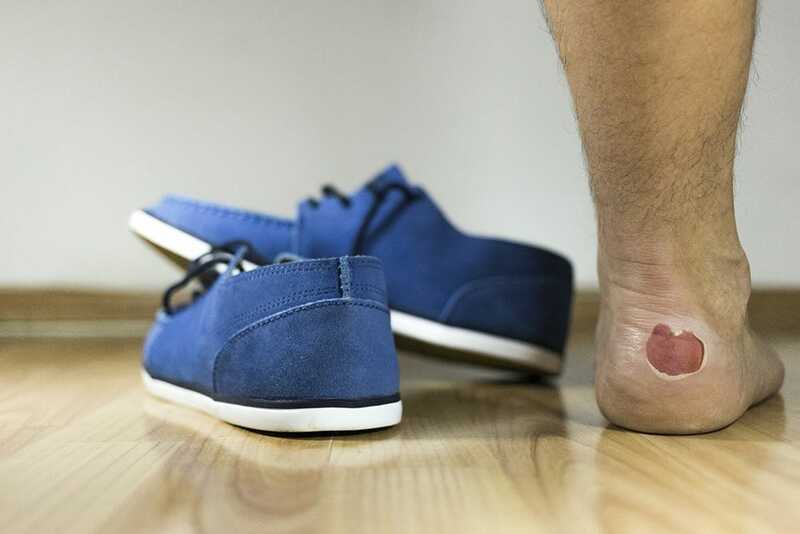 Causes (blisters): Often appear after walking and running, especially if the feet have become sweaty and you are wearing shoes that are tight. Causes (corns): Can be caused by bunions, hammer toe, or ill-fitting shoes. Blisters are some of the most common problems that occur with feet and the majority of people will suffer from them during their life. Blisters are essentially fluid-filled pockets and are not a serious concern, but it is best not to burst them and to let them heal on their own. Corns are patches of thickened skin that usually appear on the bottom of your feet or toes and form to protect the skin to stop blisters developing. While corns are painless, to begin with, they can become painful over time and will need to be treated. For corns and blisters, there are lots of products that can help you such as the gel toe pads and gel looped toe separators, which both create a spongy cushion protecting your corns and blisters. For blisters that have popped it is advised that you wash the area with warm, soapy water and to apply an antibiotic ointment to the area. Corns and calluses are best treated by using thick cushioned socks over thin ones (read our helpful guide about choosing socks here), wearing women’s or men’s wider fit shoes and moisturise your feet to help keep your skin soft. Peripheral neuropathy is the most common type of diabetic neuropathy and is a type of nerve damage that can occur if you have diabetes. It most often damages nerves in your legs and feet, followed by the hands and arms. Some of the symptoms range from pain and numbness, tingling, sharp pains or cramps, muscle weakness and loss of reflexes. Medical professionals say that maintaining a good, healthy lifestyle and keeping your blood sugar level under control can help you treat your diabetic neuropathy. A person with diabetes should go for regular foot examinations and have their toenails professionally trimmed. If there are any foot wounds, then you should seek medical attention. “They can modify their footwear with appropriate shoes and/or inner soles and often physiotherapy can be very helpful in settling many foot conditions, particularly following injury or surgery. Although many of the exercises that can be performed are readily available on YouTube, one-to-one physiotherapy is the preferred route after having had an established diagnosis made. If you are suffering from foot pain problems, then take a look at the footwear from Cosyfeet as we boast styles that have extra roomy fitting for women and men.